How do we collectively pay for construction and maintenance of "free" highways and other roads? Fuel taxes. In light of the inability to collect fuel taxes from electric car drivers, the State of Washington has passed a law requiring a yearly $100 fee to own an electric car. The fee goes into effect early in 2013, and has criticism from an electric vehicle advocacy group. The phrase for "fuel tax" is probably not the best way of describing this fee. Because the purpose of gasoline taxes is to pay for road maintenance, a better phrase would be "road use fee". That is, the homebrew biodiesel maker does not fuel their vehicle at a diesel pump, skipping paying any road use fee (fuel tax) they'd pay at the pump. Likewise, the electric vehicle owner is not refueling their vehicle at a gasoline or diesel pump, and also skips paying road use fees (fuel taxes). So long as the total number of electric vehicles is small, the amount of road use fees lost by the government isn't enough to worry about. But as electric vehicle adoption grows the lost road use fees grows, and if the adoption of electric vehicles successfully results in millions of electrified vehicles on the roads, there will be significant wear and tear on the highways caused by vehicles whose owners are not paying road use fees. The fee in Washington State was included in House Bill 2660, and goes into effect on Feb 1, 2013. Electric vehicle owners must pay the fee at the time of their annual vehicle registration renewal. The $100 fee is in addition to the standard vehicle registration fees owed each year. An AP report covering this quoted Fred Nelson, a Nissan Leaf owner in Spokane, saying "It's a little frustrating. I do understand the logic behind it because we don't pay gas taxes." Joe Lambrix of Olympia WA expressed frustration claiming that because he pays taxes on electricity, that should be enough. However, electricity taxes are not directed to highway funds to pay for the highways. Jay Friedland, legislative director of Plug in America, the principle electric car advocacy group, gave this statement: "$100 isn't that big of a deal, but it's not a well-balanced policy. EV drivers really want to pay their fair share but it seems ridiculous from a policy standpoint." On the one hand the government is providing tax incentives to incentivize purchase of electric vehicles, but on the other hand the state is imposing a flat fee on those same electric vehicle owners. The flat $100 fee is not anonymous, and is not based on the actual usage of each individual driver. Those who drive very little would be disproportionately charged a higher amount per mile than those who drive a lot. The fee will expire on the effective date of legislation which imposes a vehicle-miles-traveled fee or tax. 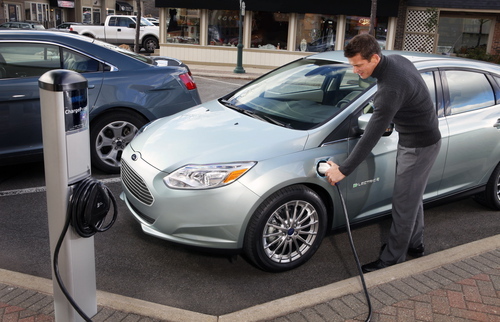 A portion of the money collected through this yearly fee will pay for a pilot program to test the administrative and technical feasibility of a mileage-based user fee system for electric vehicles. That pilot project is expected to conclude by July 2015. Washington state should collect the highway user fee for electric vehicles as a portion of the electricity bill taxes and fees. The utility should be sending the electric vehicle portion to the Highway Dept. Anything else is double taxation. Please remember that the gasoline tax does not directly fund road repair. In fact, a significant percentage of the gasoline tax is diverted to other uses such as mass transit (trains). So It is hard to not to giggle a bit that there is a tax on EVs that then goes in part to fund trains burning diesel. I am not an expert on Washington State's state tax system, but In Mass. all funds collected go to the general fund and are then spent by the legislature. It is prohibited by the state constitution to sequester funds for any specific purpose. Tolls, sales tax on cars, excise tax, even the RMV's profit, which exceeded a half billion recently, all must be placed into the general fund. Good luck trying to figure out how much auto related funding goes in vs how much comes out.